Luxury electric car maker Tesla Motors, feeling most likely on top of the world in the wake of the recent major partnership with Toyota, is not resting on its laurels, recently announcing expansion into two new and significant markets. One sees Roadsters hitting the roads of Canada, while another finds the company opening its first retail location in the heart of Switzerland, the company’s largest per-capita market. Tesla said that in Canada it was now delivering its first Roadsters to eagerly awaiting customers. 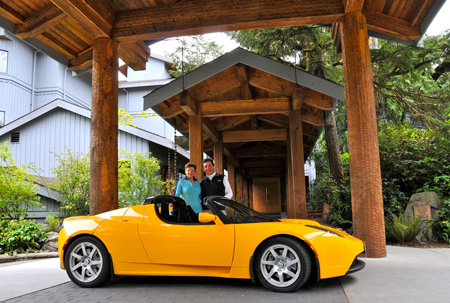 Folks ranging from “Toronto to British Columbia” are now zipping around the countryside in their electric sports cars, even as Tesla plans on further growth in this nation via its first Canadian store in downtown Toronto later this year. It will also be showcasing the Roadster at a stop in Waterloo, Ontario as part of its summer North American road trip. On the Swiss front, Tesla is planning to open in early June its newest showroom in Zurich. This location, like others around the world, will let would be drivers see the Roadster close up, as well as offering test drives. It will offer sales obviously as well that continue the company’s track record of over 1,000 of its vehicles sold in over 25 countries. Switzerland, as previously mentioned, is the company’s largest per-capita market, with over 50 vehicles delivered to this particular smaller population group alone.